﻿ Special mold & molding technique for the non-taper screw. Production of the Non-taper screw by mold injection. ※　The patent is granted. Materialization of the non-taper resin screw whose length is over 300mm. Before our materialization, it was considered as impossible to be manufactured. Achievement of taper ０(zero) by using the special mold! Large reduction of the total amount of resin at the part of the blade!! it will lead to the reduction of the total amount of resin. it will be connected with the reduction of cost and weight saving. Artifact is considered to be cancelled by the effective conveyance of toner. By the effective conveyance of total amount, the rotation number of screw will be decreased, and as a result, it will be connected with the reduction of the electricity consumption. Materialization of identically shaped object with the metal screw by insert-molding. 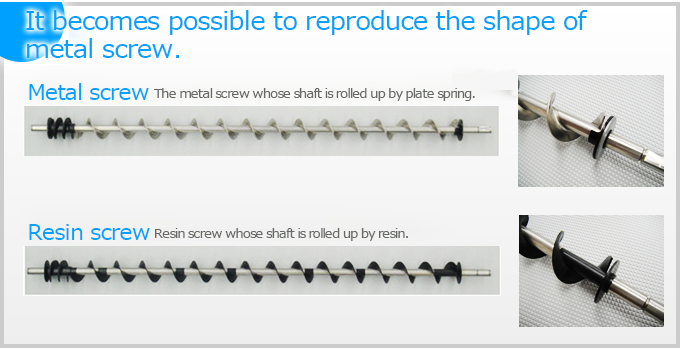 Different from the metal screw whose shaft was rolled up by plate spring, it becomes possible to maintain its strength by rolling up the resin at the part of the shaft!! In terms of the material of screw, by shifting from metal to resin, it will be directed to the weight saving and reducing the cost. ・Availability of the gradual change of pitch. ・Thickness of the blade can be changed with the complete control. (However, it will be followed to the resin property). 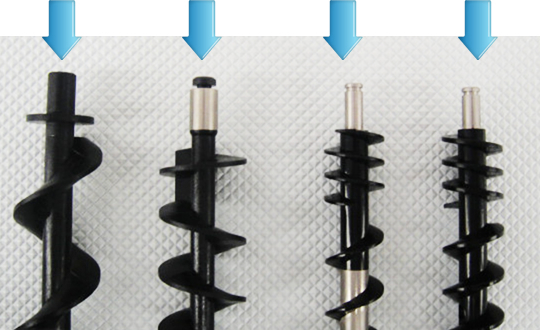 ・Availability of two screws in one shaft. ・A size of major diameter of the external thread can be switched. Please feel free to contact with us if you cannot find the shapes which are not listed above. We are dealing with both handcrafted trial manufacture and test metal mold, so we are contributing for the craftsmanship from the initial stage.